Zion Market Research has published a new report titled “Tire Cord and Tire Fabrics Market by Vehicle Type (Commercial Vehicles, Off-Road Vehicles, Bicycles, Personal Vehicles, Light Commercial Vehicles, And Two-Wheelers), by Product (Steel Cords, Nylon Dipped Cords, Polyester Cords, Rayon Cords, And Others), and by Region: Global Industry Perspective, Comprehensive Analysis, and Forecast, 2017-2024”. 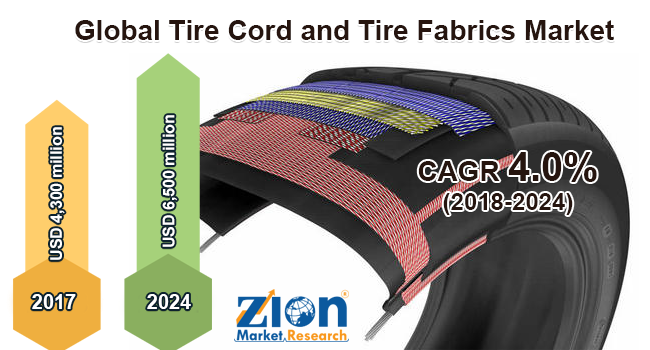 According to the report, global tire cord and tire fabrics market was valued at around USD 4,300 million in 2017 and is expected to reach approximately USD 6,500 million in 2024, growing at a CAGR of slightly above 4.0% between 2018 and 2024. The cord and tire fibers can be termed as a most important material that is used in the manufacturing of the tires. The tire cords can be termed as the backbone of the tire carcass as they provide safety, stability, and comfort to the vehicles. Personal vehicles, heavy vehicles, and off-road vehicles are the major type of vehicles that come under the category which largely use cord and tire fibers. The tire cord and tire fabrics are been largely developed by various key players in the market as the demand for degradable tire fabrics have increased in the past few years. This increase in demand is due to an increase in the sales of automobiles and due to demand for the tire material which is easy to decompose and has better stability and efficiency. Variety of materials that are used in the automotive tires are steel, cord fabric, carbon black, and various others. They are largely in demand as they have various properties such as high resistance, stability, and others. The increase in the awareness for biodegradable products and raising awareness to reduce the pollution has increased the demand for tire cord and fabrics. A major restraint for the global tire cord and tire fabrics market is competitions among the key players. However, robust growth in the automotive industry is expected to provide various opportunities for the key players operating in the global tire cord and tire fabrics market. The global tire cord and tire fabrics market can be fragmented based on product, vehicle type, and region. Based on vehicle type, the market is segmented into heavy commercial vehicles, off-road vehicles, bicycles, personal vehicles, light commercial vehicles, and two-wheelers. Based on product, the market is segmented into steel cords, nylon dipped cords, polyester cords, rayon cords, and others. The automotive sector is expected to be the most dominant segment of the global tire cord and tire fabrics market and is expected to maintain this inclination over the predicted period. Increase in demand for passenger vehicles is expected to drive the demand for tire cord and tire fabrics in the years to come. Based on region, the market is segmented into Asia Pacific, Europe, North America, Latin America, and the Middle East & Africa. The Asia Pacific had a dominant position in the tire cord and tire fabrics market in terms of volume in 2017. This can be attributed to the huge demand for vehicles sales in the various regions of the Asia Pacific. Various investments are also been done by various companies and organizations for the development of the market. North America tire cord and tire fabrics market is also expected to witness significant growth during the predicted period as various companies are investing to accelerate the growth of the market. Some of the major players operating in the global tire cord and tire fabrics market are Firestone Fibers & Textile Company, Kordarna Plus A.S., Cordenka GmbH & Co. KG, Kolon Industries, Inc., Kordsa Global, Inc., Hyosung Corporation, Tokusen Inc, Teijin Ltd., SRF Ltd., Milliken & Company Inc., Firestone Fibers & Textile Company, and others.